This large ( 4.5" x 4" ) meter is great for easy temperature checks. It comes with a 12" or 5" thermocouple, 3' of extension wire, and a mounting bracket that allows for either horizontal or vertical mounting. This meter which is guaranteed for 1 year. It has both Centigrade & Fahrenheit scales. This reliable and accurate digital pyrometer is perfect for Raku or other applications where an instant temperature measurement below the maximum reading of 1999°F is needed. User can select resolution between temperatures displayed in whole degrees or 1/10’s of a degree. Readings can also be selected between Centigrade or Fahrenheit. The unit comes with plug-in connectors and 3' of wire.Thermocouples and additional wire sold separately (below). 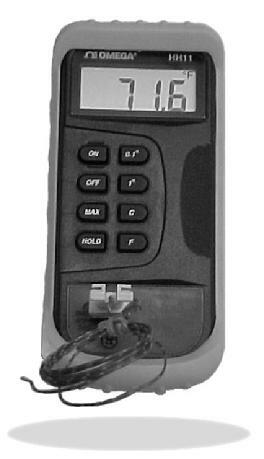 This digital pyrometer provides instant and accurate temperature readings in Centigrade or Fahrenheit. Know instantly if you're gaining or losing temperature. 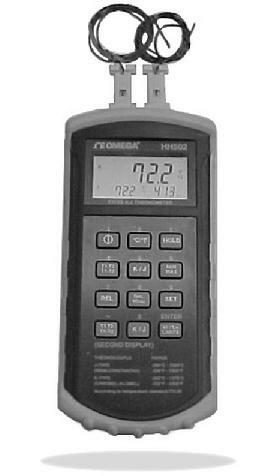 The HT200 has dual inputs and a temperature differential reading function. 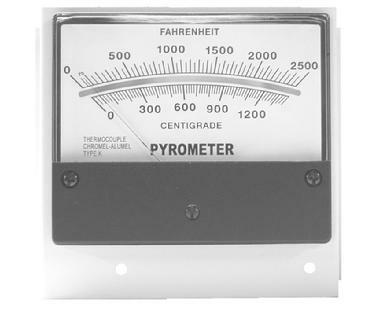 Pyrometers are powered by a user replaceable 9 volt battery and feature a shock-absorbing cover and built in stand. The units come with plug-in connectors and 3' of wire. Thermocouples sold separately (below). With extra connectors, wire, and thermocouples, different zone measurements are virtually unlimited. Maximum temperature: 2498°F. This heavy duty thermocouple is easy to install and hook up. Good for all types of firings. For extended thermocouple life in salt and wood kilns, we recommend the optional protection tube. These connectors are the same type that plug into the Digital Pyrometers. With these and additional wire and thermocouples, you can create as many measured zones in a kiln as you want. They're especially great for wood kilns. Each connector has a labeling window to identify your zone. Simply plug in and measure.